Entrepreneur Aase Lium-Hall at Leka Design, Victoria. “I’m very interested in the placement of objects in space and the aesthetics of colour, shape and design,” says Aase. Of Scandinavian heritage, her background includes Art History, curating African art, yoga instruction and financial planning. With her husband, she has traveled the world and shares two children, 12 and 11. Aase works closely with clothing customers to fill their needs. From feedback and suggestions she engages in “dynamic design”. Simplicity, elegance and style for all women with various body types is the goal. “My idea of design is to fill a need, not create one. Through my business, I honour all women and fulfill an essential role by serving the public. English Department at Camosun College. As a busy working woman, Kari requires an easy-care, stylish wardrobe. “Leka clothing feels comfortable and looks professional,” she says. Special orders and quality control are top priority. Kari delights in the rich colours of the flowing garments: bright aqua blues, tangy raspberry shades and deep delicious purples. “They mix and match so well," she says. 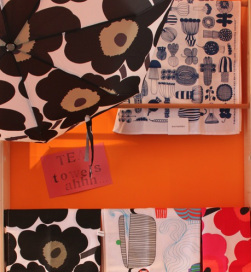 Kari savours Leka's cheerful scarves and artisan jewelry. She has several pairs of hand-warmers to keep her cozy while working. Sarah Chritchley is a family doctor with three young children. Her basic wardrobe comes from Leka with styles and colours that suit her active lifestyle. Doctors have long busy days, Sarah explains. With limited shopping time, Dr. Chritchley appreciates the attentive customer service. “Aase and her staff are friendly and accommodating,” she says. Needing a different size or colour is no problem. Leka’s on-site sewing room ensures custom orders are quickly completed. Laura Imrie (left) in Leka's on site sewing room. Leka’s high quality clothing is designed and constructed on-site by a talented team. Laura Imrie (left) and Meaghan Smith draft patterns, then cut and stitch fabric into leggings, skirts, dresses, shirts and lingerie. While interacting with customers, they receive valuable feedback about the products. Adding a personal touch, new designs are often named after clients. 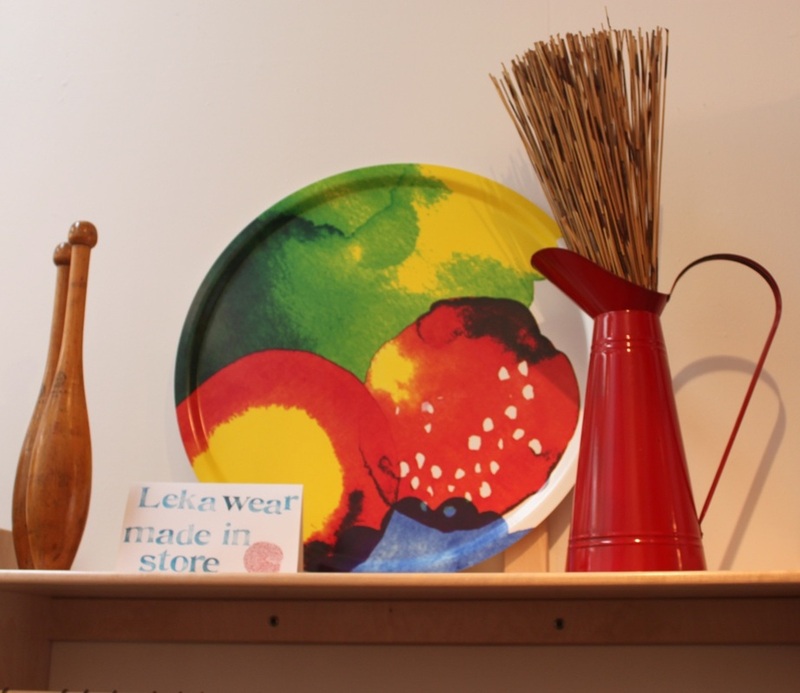 Leka Design Inc is located at 1044a Fort Street, in Victoria. Kate has a History in Art degree and Public Relations certificate from the University of Victoria. For ten years, she operated an art & framing shop.